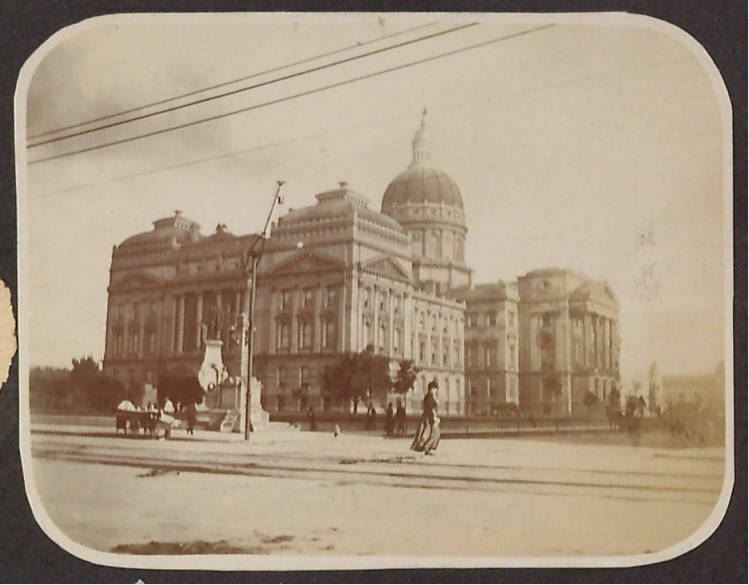 The Indiana State House, photograph by Earl Brooks. Indiana Memory. During intense political battles, particularly in the legislative branches of government, shouting matches sometimes turn into full on fights on the floor. This is especially evident with the intense, but weirdly funny, videos of legislators beating each other up. One from Time magazine, called “Politician Brawls Caught on Tape around the World,” displays this weird juxtaposition of suited politicians acting like completely foolish children. However, it would be naive to think that this type of behavior is limited to the present. 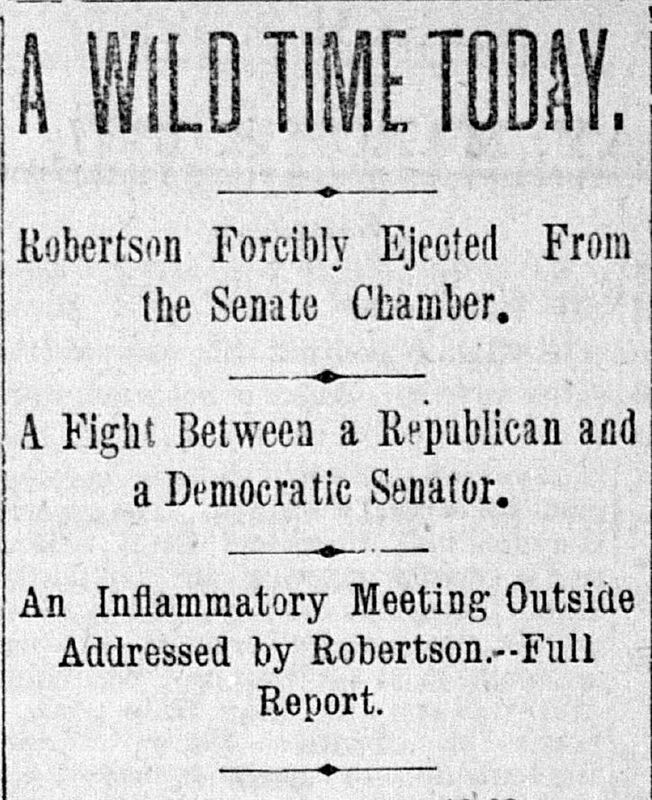 In fact, one incident in Indiana’s legislature during the late nineteenth century demonstrates that political brawls go back much further. 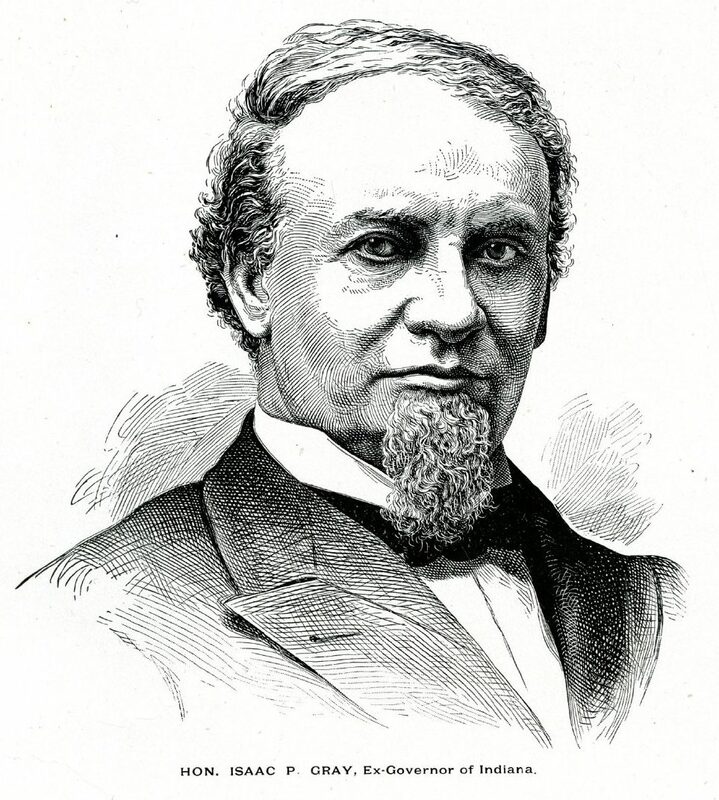 Governor Isaac Gray, 1884 engraving, Indiana Memory. Beginning as an electoral dispute that turned into outright violence, the “Black Day” of the Indiana General Assembly remains one of the darkest moments in Indiana political history. In 1885, Governor Isaac P. Gray, who had recently assumed the office, expressed public interest in an Benjamin Harrison’s U. S. Senate seat when Harrison’s term expired in 1888. The Republican-turned-Democrat Gray’s aspiration hit a snag when his lieutenant governor, Mahlon D. Manson, resigned. Some critics charged that Gray could not vacate the governorship if there was no successor in place. After consulting with Attorney General Francis T. Hord, Hord recommended that the lieutenant governor’s vacancy be filled at the next election in 1886. Gray trusted that the Democratic nominee for the office, John C. Nelson, would win. Instead, the Republican challenger, Robert S. Robertson, won the election, thereby yoking the Democratic Gray with a Republican successor. 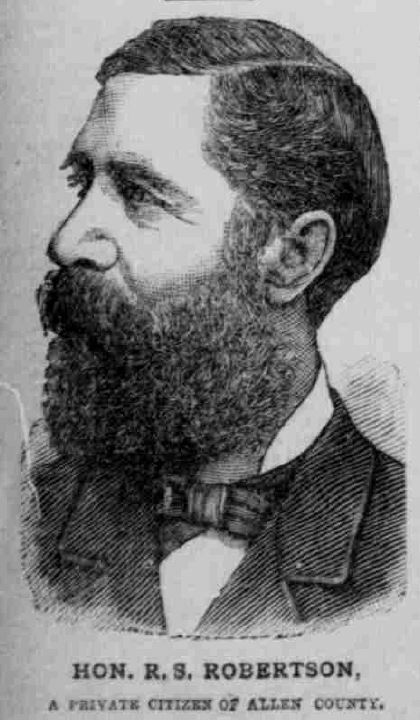 Alonzo Green Smith, Indiana State Sentinel, March 2, 1887, Hoosier State Chronicles. 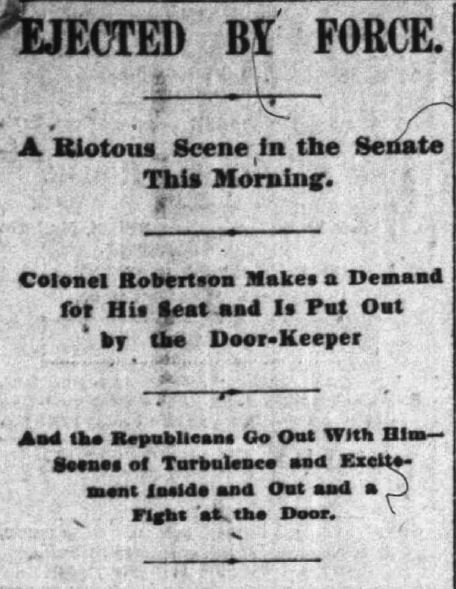 Robert Robertson, Indiana State Sentinel, March 2, 1887, Hoosier State Chronicles. 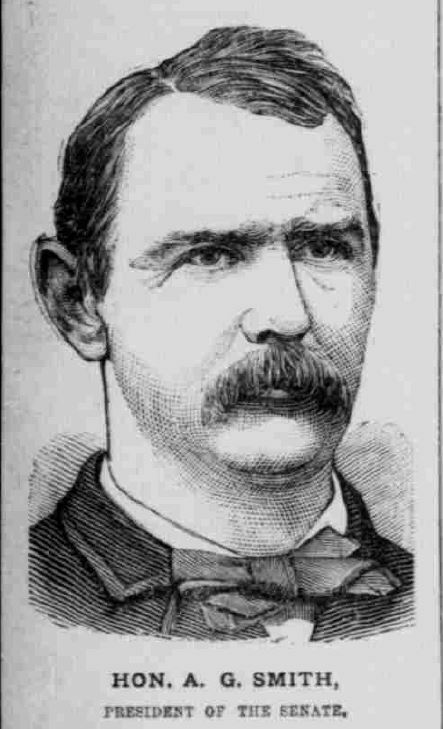 Indianapolis Journal, February 25, 1887, Hoosier State Chronicles. The trouble between Senators McDonald and Johnson occurred in about this way: . . . McDonald took hold of him, probably with no belligerent intention, and he was pushed over the arm of the sofa, near the door, when he got up. McDonald still had hold of him and Johnson struck him between the eyes, and then each man tried to impair the facial beauty of the other, but the crowd prevented. . . .Doorkeeper Pritchett [who] looked like he had been through a thrashing machine. 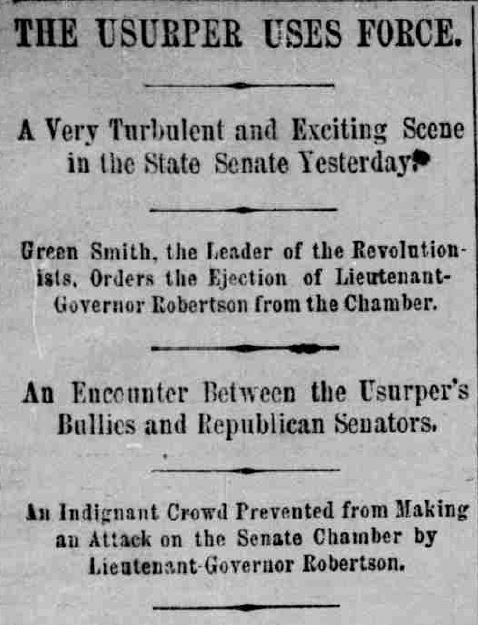 Indianapolis News, February 24, 1887, Hoosier State Chronicles. Terre Haute Weekly Gazette, March 3, 1887, Hoosier State Chronicles. The next day, Robertson attempted to be seated again but was “denied by the doorkeepers.” Not furthering legal action again Green and the Democrats, Robertson was never seated, and his election as lieutenant governor was never formally recognized. These ruckus machinations ruined Governor Gray’s campaign for the U.S. Senate and even fueled the campaign for the direct election of senators, which became the Seventeenth Amendment of the U.S. Constitution in 1912. Overall, the “Black Day” of the General Assembly remains one the darkest and most unsettling moments in Indiana political history. It reminds us that while the rancor and partisanship of our own time is certainly upsetting, historically speaking, it’s been much worse. Justin E. Walsh, The Centennial History of the Indiana General Assembly, 1816-1978 (Indianapolis: Indiana Historical Bureau, 1987). Mitchell Walsh, Dennis L. Walsh, and James E. St. Clair, “Isaac P. Gray,” in The Governors of Indiana, ed. Linda C. Gugin and James E. St. Clair (Indianapolis: Indiana Historical Society and Indiana Historical Bureau, 2006). Some material for this blog originally appeared on my other historical blog, IGA History: http://bit.ly/2lzzZrJ.